Before Coca-Cola’s jolly white guy with a twinkling eye, there was a generous 4th Century bishop from Asia Minor who, by the 11th Century, had become the patron saint of children and Amsterdam, among other things. Legends told of his kindness and the miracles he performed to help the poor. He was an older gentleman with a beard and sleigh, who would fill good children’s empty shoes with cookies and oranges or threaten the naughty ones with switches. Now, most of us call him Santa, and on December 6th, it’s his feast day. That’s when, according to the Hudson Valley’s Dutch forefathers, he’d arrive by boat from Spain at every Dutch port city in turn. And that send-off is where the Hudson Valley’s Sinterklaas celebration really begins. On the last Saturday in November, Sinterklaas departs from Kingston’s Rondout and crosses the Hudson River to a much-anticipated arrival in Rhinebeck the first Saturday in December. His send-off this Saturday, November 29th, offers an opportunity for children to enjoy the essential parade and cookies, as well as experience the beginning of the Sinterklaas celebration. The children’s parade begins at 4:15p and runs just two, easy, downhill blocks from A.S.K. Art to the waterfront. Beforehand, there’s a puppet show at A.S.K. Art, a Crown & Branch-making workshop at the Maritime Museum, a storyteller at the Trolley Museum, a Wayfinder Experience at Gallo park, plus various offerings, like live music and hot cocoa, at participating stores on Broadway and the Strand. And for adults, there are special musical guests at Mint, a pop-up holiday shop at Milne’s At Home Antiques, a tasting to highlight affordable esoteric wines at Kingston Wine Co., and a post-parade soiree at Mariner’s Harbor. And it’s all free! Susie Linn, a co-producer of Kingston’s Sinterklaas, says it’s a real community event, where a grassroots effort (volunteers are always needed) is boosted by grants and support from local foundations and businesses. It’s all designed to bring Hudson Valley families together to make our own warmth and light and to celebrate the coming winter season. 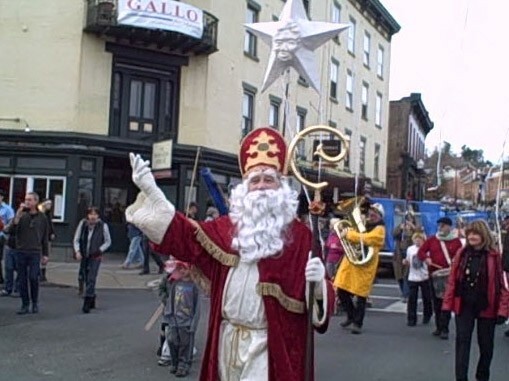 For more info and a full event schedule, go to Sinterklaas Kingston, downtown Broadway, on the Rondout, Saturday, November 29, 11am-7pm, children’s parade at 4:15p at Broadway and Garraghan Drive/Spring Street.